Because you’ve paid good money for it and servicing it will keep it in tip-top condition for years to come. Remember the feeling when you first wore that new helmet, jacket or suit? You can cop that feeling again without the expense of buying new. More seriously, poorly maintained kit can be dangerous. Leather loses its strength, and it will smell if not cleaned regularly. Helmets need regular cleaning inside and out. Cleaning the shell shows up any possible damage. Cleaning the lining reduces any chance of bacteria forming and causing skin complaints. Leather cleaning is a specialist job, isn’t it? Only fashion leather requires specialist cleaning – we’re talking suede jackets, gimp suits, sofas etc. Bike gear can be cleaned by anyone if they’re careful and if the leather is then fed with nutrients to retain its strength. Helmets just need a touch of furniture polish don’t they? Not if you want to smell of lavender and other such wax perfumes. You wouldn’t polish your car with such cheap cack would you? 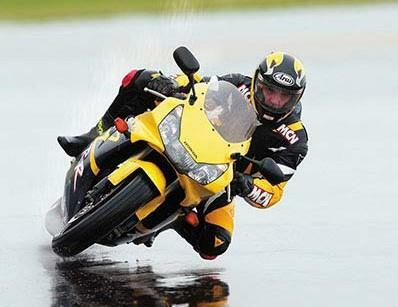 No, so treat your helmet with the same respect if not more... your life may depend on it. Cotton cloth (lots of it), fresh water and kitchen roll. 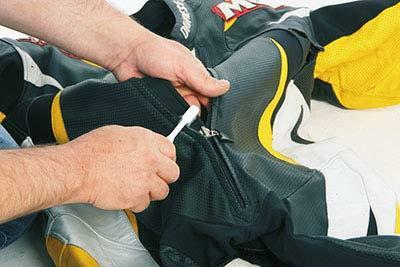 Specialist materials include leather cleaning and feeding agents for leather materials (boots, gloves, race leathers, suit or jacket). 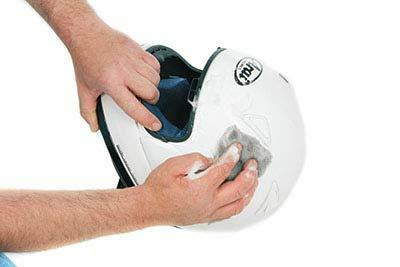 Helmet lining cleaners are also available and usually very good. 1. Leather is used for bike gear because it combines strength with suppleness – a bit like human skin. And, just like human skin, it’s susceptible to damage from the wind, sun, rain and insects – some of the really gloopy bugs will stain and rot leather. And let’s not forget the natural grime of dust and man-made stuff like oil and grease. 2. 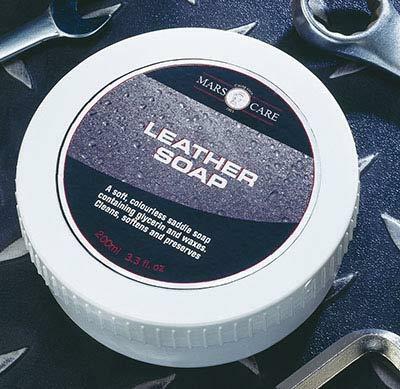 There are many brands of cleaner available but bespoke leather suit makers Crowtree Leathers use a specialist leather cleaner by Mars. Note: leather feed is not a cleaner. Feeding leather before it is cleaned will trap dirt and grit in the leather’s natural pores and it will still look grubby. 3. Using a soft, natural bristle nail brush, or foam mesh lightly dipped in cleaner, small areas (arm, shoulder, one panel of leather) at a time (to avoid drying) need to be gently scrubbed in a circular motion to tease dirt and insect debris of the leather. Excess cleaner should be wiped off immediately with kitchen roll or soft cotton cloth. 4. Once a panel or area of leather has been cleaned the dirt needs to be removed. Using cotton cloth dipped in water and wrung out, cleanse the leather panel like cleaning a wound. You’ll be surprised how much muck comes away. Frequently rinse the cloth out. Don’t go overboard with the water – saturation defeats the object. 5. 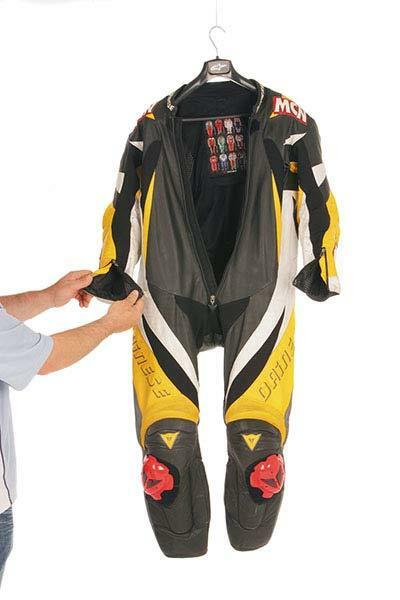 When the suit has been cleaned leave to dry by hanging up on a coat hanger with zips open to enable the suit to air, preferably overnight and not near a radiator. Using the same panel-by-panel technique, apply leather feed. Be careful on your choice of feed as certain colours can tarnish the leather. 6. Don’t go mad with the feed: too much and you’ll end up with a sticky suit. The general rule is little and often; clean your gear every three to four months if you’ve been lucky enough to get a lot of miles racked up. Once the suit has been fed, gently buff each panel of leather with a soft cloth to a shine using a circular rubbing motion. 7. Once again leave the suit to air (see step 5). Finally give the suit a final, quick buffing to bring it up to a glorious shine. 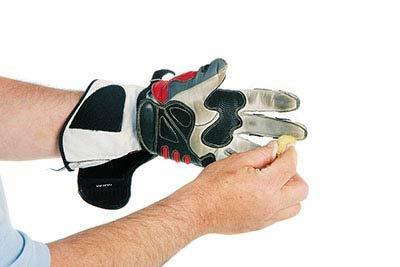 The same technique of cleaning and feeding should be applied to leather gloves on a regular basis. Because hands/fingers are constantly moving, dirt and grease gets worked further into the leather’s pores. 8. 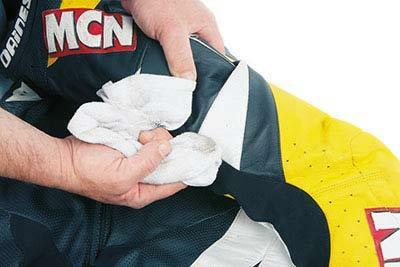 As far as zips are concerned, either on a suit, jacket, gloves or boots, they need to be cleaned, too. Grit in zips will wear out the connecting teeth, and worn teeth can lead to the zip bursting apart in the event of an accident. Zips should be washed with nothing but water and a soft nail brush. Lubricant attracts grit. 9. Leather boots should be revived in the same way as leather garments. If the boots are man-made material (Lorica and lots of plastic armour) these can be cleaned with water and scrubbing brush. Mild soapy water should be used to remove grease spots. Plastic armour comes up lovely with spray-on wax furniture polish. 10. 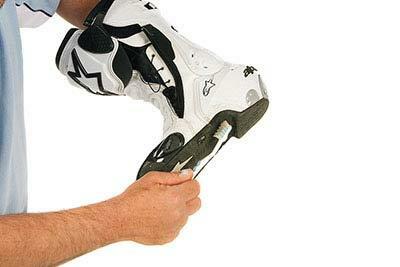 One area on boots that requires particular attention is the join between the sole and upper. It is a great collector of mud and contaminated surface water, which just sits there rotting any stitching or glue. 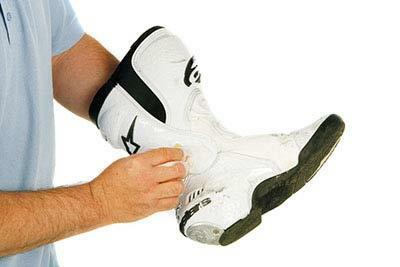 Gently clean the boot with water and an old toothbrush. Then apply leather feed (if the boots are leather). 11. 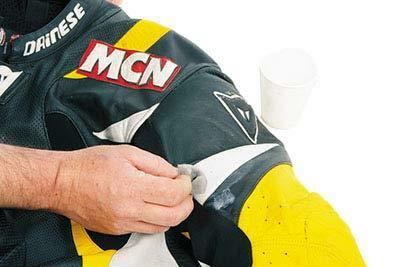 To spruce up the painted shell of a helmet MCN’s road testers recommend using a soapy solution of liquid hand soap and warm water applied with a soft cloth. Use a toothbrush to access under the vent pods. Use clean water to wash off residue and towel dry. We don’t use polish on our lids but if you do make sure it’s ok for plastics. 12. 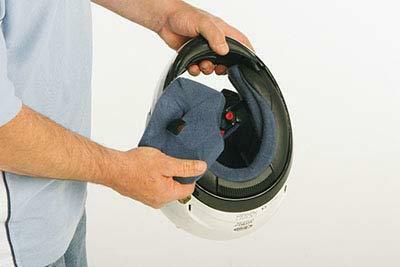 Helmet interiors can be washed with a mild solution of baby shampoo and warm water and rinsed off with clean water. If the material lining is removable it can be rinsed off in a shower. Non-removable lining needs to be dabbed with cloth and water. Dry the lining thoroughly by hair dryer or overnight. Buy a new visor for a clear view of summer.